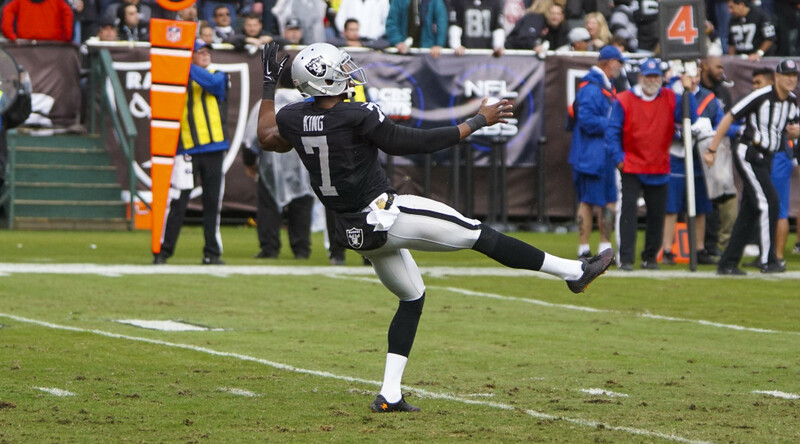 ALAMEDA, Calif. – Oakland Raiders P Marquette King has been named the AFC Special Teams Player of the Week for his Week 16 performance against the San Diego Chargers, the National Football League announced today. This marks the first time in King’s career that he has been named the AFC Special Teams Player of the Week. A Raider has now won the award 23 times, with King’s recognition being the first since K Sebastian Janikowski won it in 2012 after his Week 15 effort against the Kansas City Chiefs. In total, a Raiders player has won AFC Offensive, Defensive or Special Teams Player of the Week 82 times. In last Thursday night’s win over the Chargers, King punted eight times for 400 yards (50.0 gross average; 49.8 net average) with a long of 65 in the Raiders’ 23-20 overtime victory over the San Diego Chargers. Six of his punts were downed inside San Diego’s 20-yard line. His 49.8 net average led the NFL in Week 16, and his six punts downed inside the 20-yard line ranked second. King pinned his 39th punt of the season inside the opponents’ 20-yard line (second in the NFL this year), setting a new single-season franchise record since the statistic became official in 1976. This is the second time this season that Oakland has had a player win a Player of the Week Award, as DE Khalil Mack won the AFC Defensive Player of the Week for his Week 14 performance against the Denver Broncos. Additionally, S Charles Woodson was named the AFC Defensive Player of the Month for October.